Race Box and Officer Training Saturday. In anticipation of the start of the sailing season the first session organised for Easter Saturday saw a good number of members turn up. They were guided through the workings of the race box and race officer responsibilities under the guidance of our Commodore Geoffrey Walkley. Unfortunately, due to the appalling conditions in the field and the continuing bad weather the keelboat launch had to be postponed. A new date is being discussed but it is hoped that boats can get in the water over the weekend of the 6th & 7th April. Despite the lack of sailing there was a good turnout for the fitting-out supper held at the Generals Arms in Danbury on Saturday evening. Maylandsea Bay Sailing Club completed its last full sailing series of the year with the Winter Series. Over the four Sundays of meets there were up to 16 dinghies. Sailing conditions varied from extremely lights winds to strong, gusting winds which tested both the experienced and less experienced. The club was pleased to welcome sailors from nearby Harlow Blackwater, Royal Corinthian and Marconi Sailing Clubs. New members are always welcome and more information can be found at the website www.maylandseabay-sc.org.uk. Maylandsea Bay Sailing Club members were pleased to welcome Father Christmas to their annual party in the run up to Christmas. It was also a chance for members to catch up before the end of the year and share sailing tales from the year. There was also a prize giving for Cadets, Dinghies and Keelboats which included the awarding of sailing Certificates to several cadets. New members are always welcome and sailing continues with the Winter Series and a Frostbite race. Training Regatta and Camping Weekend -- September 29/30. o Why not come along to the TRAINING Regatta on Saturday September 29. Come along and watch our youngsters show us what they have learned this year. o BBQ/Social in the evening. All 2012 joiners especially welcome. We have been forced to defer the Laying Up Supper and prizegiving by a week. It is now on Saturday November 17 and is again being organized by Nigel Whiting at The General’s Arms, Little Baddow. This has been a successful venue for us so please put this date in your diary. Menus will be circulated soon. · Work Party – October 13 at 10am. Please come along and help. · A plea for unwanted sailing kit.. We feel that we need to upgrade and expand our supply of sailing kit (especially buoyancy aids and spray tops) for use at Open Days. Items are expensive to buy so if you have any such kit that that you no longer want (but is in a reasonable condition), we would really appreciate them. We are especially short of adult sizes. Please contact me or just bring them down to the club and give them to a committee member. Thank you. Maylandsea Bay Sailing Club held its annual week of sailing and onshore entertainment during Maylandsea Bay Week. Results were: Fast Handicap Dinghies - Chris Grice & Neil Raven (Kestral); Short Course Dinghies - Julie & Matthew Bachelor (Pico); Cadet Winner - Barney Broomfield (Pico); Crew's Race - Neil Raven; Cadet Crew's Race - Max Delap; Overall Male Helm - Chris Grice; Overall Female Helm - Lauren Grice; Laser Winner - Ollie Cook. Laura Thame received the Endeavour Shield for most improved sailor and notable winner of the Scuttle Trophy was Ann Dyson. Overall Mud Race winner was Barney Broomfield with Lauren Grice being the first female home. "We've had a fantastic week with 51 boats, crewed by club members and visitors from all age groups, sailing in quite challenging weather and tidal conditions. With a large entertainment programme after sailing, both on dry land and in the mud at low tide, the club was busy and vibrant throughout the week and everyone contributed to and enjoyed its very friendly atmosphere." 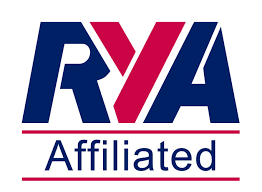 With much more sailing to be done this year Maylandsea Bay Sailing Club is open to new members who can benefit from reduced rates for the remainder of the season. We also have an exciting upcoming Winter Series which is open to visiting dinghy sailors. Photo courtesy of Teresa Giles. Goodbye Maylandsea Bay Week 2012. After a week of great sailing, fun and games for all the week ended with the prize giving, dinner and disco. Many thanks to Paul, the MBWeek committee and all who helped make is such a great success. Full race results can be here. Go to the MB Week pages for more. A sailing briefing will be held on Sunday 12th August (at approximately 19:00) in the Club House. Sailing Instructions and Course cards to be published shortly.